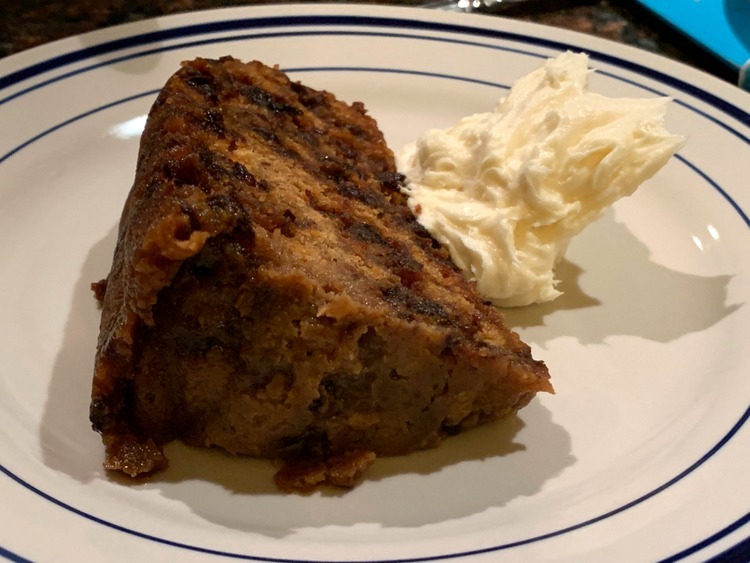 This year I made my first English plum pudding, which I also learned is not a pudding and has no plums in it. Astonishing. I now understand that the English refer to all desserts as puddings. However, the same (British) source that told me that had no explanation for Yorkshire pudding, which is most definitely savory. According to the dictionary, an English pudding can be sweet or savory, but it is cooked using steam. 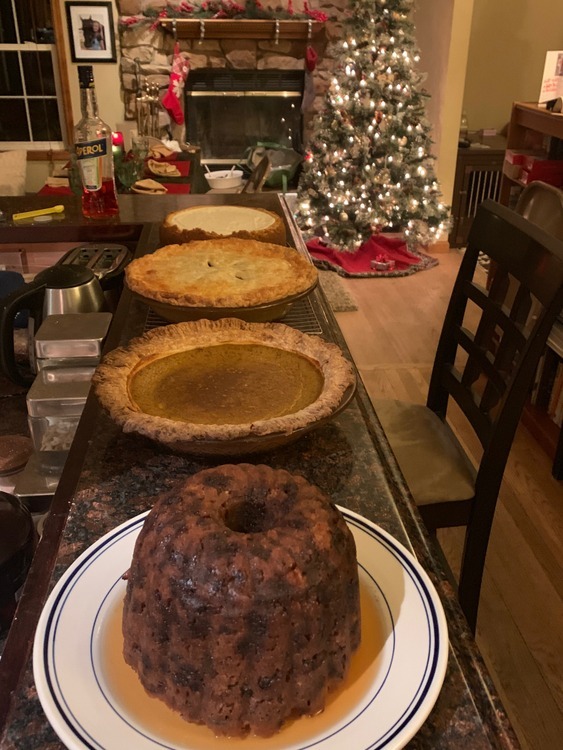 However, even a cursory investigation into English pudding recipes reveals that many so-called “puddings” are baked, not steamed. So, I am no closer to an understanding of how to correctly use the term pudding in English nomenclature than I was to begin with. 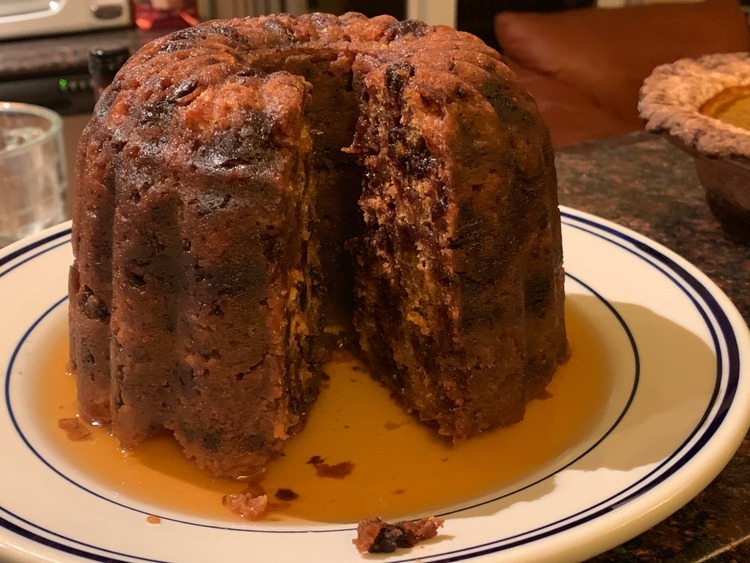 Nonetheless, I have been reading Dickens lately, and it is impossible to read A Christmas Carol twice and not wanting to taste Mrs. Cratchit’s magnificent pudding (or pudding-not pudding). 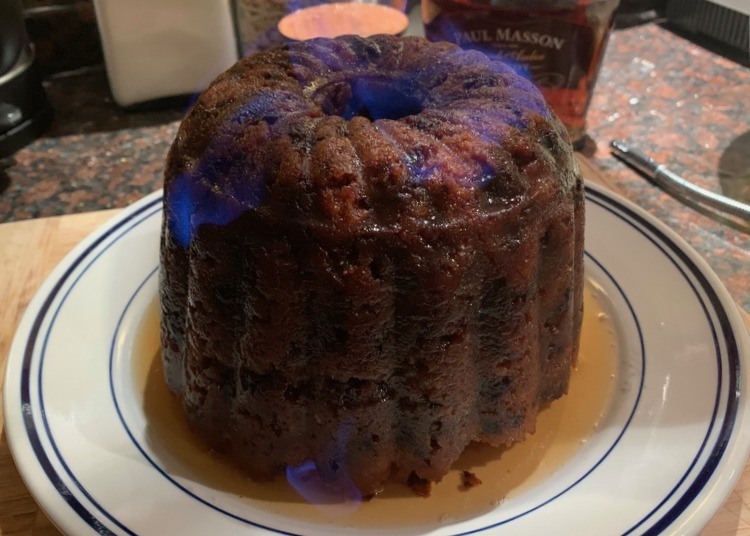 And it is impossible to read recipes that involve brandy flambé and not wanting to join in the merriment. So here we go. You will also need a small rack upon which to place it in the pot so that the bottom does not scorch. This is similar to the one that I use. And you will need to be home for 6 hours while it steams. Yes, you read that right. Six hours. Also, this pudding improves with age, so make it a week or two before you wish to serve it. Tear bread into pieces and place in the bowl of a food processor. Pulse to form rough crumbs. Empty the crumbs into a large bowl. Add the raisins and currants to the food processor and process until finely chopped, but do not let them process into a paste. You want some texture to them. Pour the raisins into the bowl with the bread. Put all of the other ingredients into the food processor and pulse to mix. Pour the contents of the processor bowl over the bread and raisins and stir to thoroughly mix. Generously butter the steamed pudding mold and pack the batter into the mold. Top the batter with a round of parchment and cover tightly with the mold lid. Cover tightly either with the lid on the mold or with a plate and/or aluminum foil. When you are ready to serve, make the hard sauce. Beat the powdered sugar and soft butter together until fluffy. Then beat in the salt and brandy. Transfer to a serving bowl and chill. To serve the pudding, remove the sealed steamer from the refrigerator and let the pudding come to room temperature. Then place it back into the stockpot on its rack and steam it until it is warm. Serve the hardsauce alongside the pudding. Just subscribed. Can’t wait to try your recipes. Thank you so much! Mindy has spoken often about you and I hope I get to meet you one day <3.